Wikipedia co-founder Jimmy Wales says he is confident his organization can defeat the National Security Agency’s mass surveillance program in a legal battle – because he has evidence that such spying caused the foundation harm. Wales believes the case may go all the way to the US Supreme Court due to alleged constitutional violations, Reuters reported. In the complaint filed on Tuesday, Wikimedia – which runs the online encyclopedia Wikipedia – and eight other groups said that one of the NSA's mass surveillance programs, known as Upstream data collection, violates privacy rights and forces people worldwide to think twice before sharing sensitive information. According to the complaint, the NSA conducts Upstream data collection by connecting surveillance devices to multiple major internet cables, switches, and routers inside the United States. With the assistance of telecommunications providers, the NSA intercepts a wide variety of internet communications – including emails, instant messages, webpages, voice calls, and video chats. The agency copies and reviews all international emails and other “text” based communications. "We have proof that it's actually impacting us from the Snowden documents. Wikipedia was specifically targeted for upstream surveillance,"Wales told Reuters on Wednesday during a Q&A session in Edinburgh. A Department of Justice spokeswoman did not immediately respond to a request for comment about the lawsuit. In an op-ed article in The New York Times, Wales said that Wikipedia has 75,000 volunteers who edit and submit content to the site worldwide, which is visited by 500 million people each month. 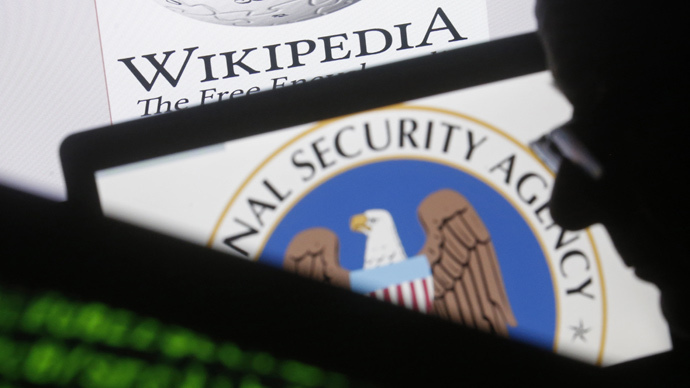 “[Whenever] someone overseas views or edits a Wikipedia page, it’s likely that the N.S.A. is tracking that activity — including the content of what was read or typed, as well as other information that can be linked to the person’s physical location and possible identity,” wrote Wales. Wales argues in the complaint that the mass surveillance is a violation of the foundation's First Amendment right to free speech and of the Fourth Amendment's ban on unreasonable search and seizure. He thinks the case, after appeals, will probably go before the US Supreme Court. The nation’s highest court previously rejected a challenge to NSA surveillance in 2013 because the plaintiffs couldn’t prove they had been spied upon. What makes the timing of this lawsuit different, though, is that that ruling was three months before secret documents were made available by whistleblower and former NSA contractor Edward Snowden, who revealed the extent of the agency's spying. Wales said that one Snowden-released document included in the lawsuit had the logo of Wikipedia among organizations whose online user data the spy agency was interested in. "We have other evidence that will be presented in court of the harm that has caused us," Wales told Reuters, without elaborating on the evidence. Lawyers with expertise in national security cases, however, have called the lawsuit a long-shot because spy agencies often block litigation by citing the need to protect state secrets.